As we continue our pulpit series ‘Taking The Bible Seriously’, I’m excited to be sharing with you about ‘The Inspiration of the Holy Spirit’ today. Before we get into that, let’s talk about the big picture first. May I ask you, when you pick up the Bible, how do you usually make sense of the words that are in it? Do you read it mostly from your perspective, your experience, your vantage point and make sense of God from there? Or do you begin by first understanding God’s perspective and story, and then you see how your story fits into God’s much bigger story and plan? I ask this question because our starting points greatly influence the way we see God and the Bible. How many of us tend to read the Bible and see God mostly through the lenses of our own joys, disappointments, frustrations and pain? If we’re honest, I think many of us do. 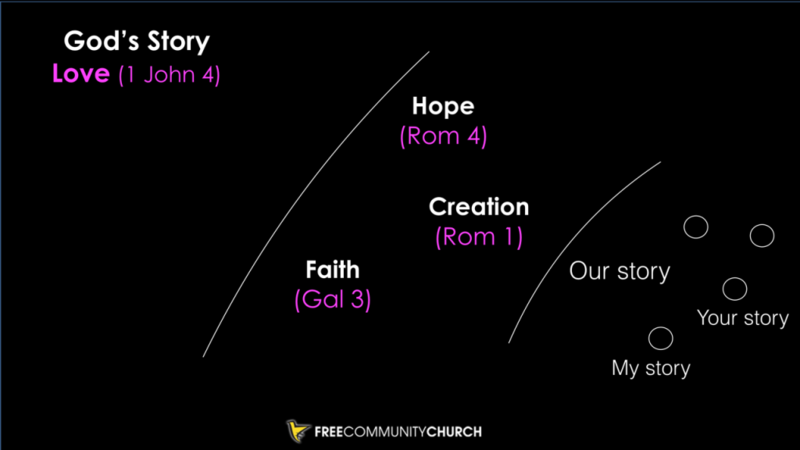 But as you can see from this diagram, if we tend to start from just our experiences or stories, our perspective of God can become very limited and skewed. 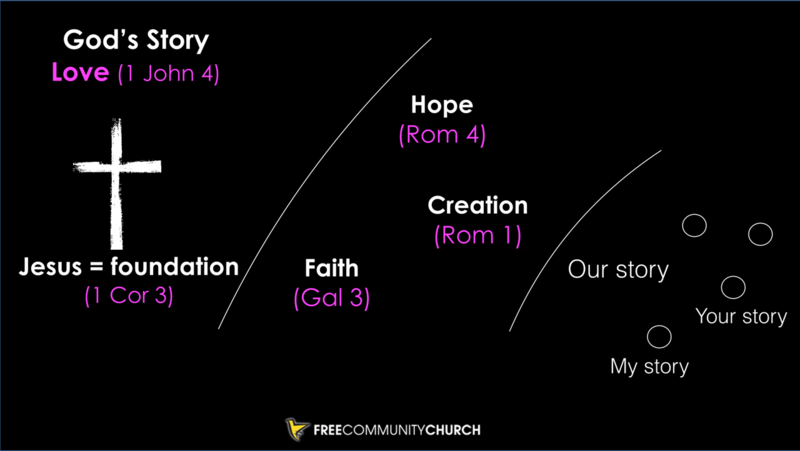 There are bigger arcs of hope, faith, love that can help us gain a deeper perspective about our lives as we see how we are but a small part of the bigger story of God. The Bible is a narrative. It comprises a collection of books written in various genres by very different people based in various locations through quite a wide span of historical periods. The Bible contains the story of God but God is bigger than the Bible. It’s not possible for one book to explain everything we could ever know about God. Our human minds would not be able to fully contain or comprehend such lofty knowledge. At the same time, God is a revealing God. God makes God’s self known through creation, through history, through the preaching of the gospel, most definitively in the incarnation of Jesus the Logos, and also by the inspiration of the Holy Spirit through human authors who wrote books that convey a divine message in the medium of human language. The purpose of revelation is that we mightknow God. God desires that we know God and be known by God in an intimate way. So the Bible is one important way for us to know God more deeply and understand our lives and stories through God’s story and perspective. If you refer to the New Interpreter’s Study Bible, you will find an explanation about the Hebrew word that is translated “the Spirit of God” here. It says the Hebrew word ruakh translates as wind or breath. The translation “spirit” rests on a later Greek division between spirit and matter that is not present in Priestly theology. So the sentence would be closer to this: The wind or breath of God swept over the face of the waters (Gen 1:2, NRSV). Why am I telling you this? Well, I think it helps us understand two things. Firstly, translators sometimes use their knowledge of the New Testament to translate certain words in the Old Testament. They do that with the intention of helping us have a clearer understanding of certain Hebrew words. Given that the Bible is quite an ancient text, there are going to be some words, especially in Hebrew that may have ambiguous meanings. So we try to understand the words as best as we can using the online and on site tools that are available to us. Miak mentioned blueletterbible.orglast week. Another online tool that I use is called biblehub.com and I also want to highlight that we have many study bibles and commentaries in our church library. So please use them as these tools can be very helpful in our study of the Bible. So as you can see, the inspiration of God and the Spirit of God in the Old and New Testaments can be understood as the breath of God or “God-breathed”. So when we say the Bible is God-breathed, does it mean it was dictated by God and the writers just wrote down whatever they heard word for word like robots? I can’t say for sure what the process of God breathing on them was like since I’m not one of the writers but other than words from God that they felt compelled to share, most of the writers also wrote about the things happening in and around them—their struggles, personal reasons for writing and their specific experiences of God. Of course I believe they were inspired by God, but they remained inspired human beings with their own biases and limitations in their knowledge of the world around them. Some Christians believe that if the Bible is God-breathed, then every single part of it must be “inerrant” and “infallible”. If every single part of it is not inerrant or infallible, then we are undermining the belief that the Bible is inspired by God. That is one view on the extreme end of the spectrum that often leads a very literal reading of the text. Many conservative scholars acknowledge that Scripture is not inerrant in matters of history and science but that it is still infallible in regards to matters of faith and morals. On the other end of the spectrum, there are scholars who belive that only the ideas of the Bible are inspired while the words were entirely the product of finite human beings and their cultural eras. They believe the Bible still has authority but they are open to questioning the use of words. There are also theologians who believe that the Bible may contain the Word of God, which confronts the reader or listener, and the inspiration of God is located in the living encounter between God and the Christian, or at most the biblical text is inspired only when it speaks to an individual. In modern times, we sometimes understand this point of view as us being touched by the Holy Spirit as we are reading a particular portion of Scripture, and we may sense God’s breath moving upon our hearts as we are convicted of an action we need to take or a direction we are to go towards. This reminds me of the time when I was in university many years ago and I was praying about my future. I sensed God leading me into full-time ministry but I wanted to be sure so I set aside Fridays to specfically pray and seek God’s heart regarding this issue. Without fail, the Bible passages that were designated by the devotional I was reading every Friday would speak to me very specifically about my values, fears, dreams and desires regarding the future. Every single Friday. And I was convicted that God was leading me in that direction and I surrendered to God’s plans for my life. Perhaps you have had a similar experience in your life where God spoke to you while you were reading the Bible through the power of the Holy Spirit. That is an amazing thing! At the same time, I have to say my appreciation and understanding of the Bible only deepened after I started studying it more rigorously in seminary. The first thing I realized was how much I didn’t know and how wrong I was to think that the Bible was black and white on many issues. Going to seminary really humbled me. And it is with that same attitude of humility that I continue to approach the study of God and the Bible today. One scholar that I came across in my research recently is Peter Enns. He is a progressive evangelical scholar whose writings Marcus Borg recommends to readers on the Patheos blog. Enns has written many books and one of them is called “Inspiration and Incarnation”. In it, Enns explains that one can have a “progressive inerrant” view of the Bible. There are several facets to it but one of the more unique ways Enns speaks about inerrancy is not as some quality inherent in the Biblical texts themselves, but rather as a conviction and openness that the believer brings to the texts — a trust that whatever the Bible does (no matter how seemingly problematic), it is nonetheless an expression of God’s will. More specifically, this means that “things like historical inaccuracies, myth, and theological diversity in Scripture”—things that we might associate with the products of what we usually understand as human processes of fallibility” are not errors needing to be explained away or minimized but, paradoxically, embraced as divine wisdom”. Enns suggests that in this tension, we can see a similar model at the very heart of Christianity: the Incarnation where the God of our universe became fully human as Christ while retaining full divinity. In the same way that Jesus is both God and human, the Bible is also a divine and human book. This is another important point that I want to remind us about as we look at the big picture. The Bible is the enduring Word of God but Jesus is the living Word of God — the foundation of our faith. As Paul writes in 1 Cor 3:11, “For no one can lay any foundation other than the one already laid, which is Jesus Christ”. Because of this foundation, we can build up from it by reading the Bible as a Christ-centered book that finds its highest testimony and interpretive center in him. That means we interpret the Bible with Jesus as our center. This is precisely how the early church interpreted the Jewish Scriptures. Look at how they read and preached about Psalm 2, 16 or Isaiah 53. These texts, in their various ways, are about Jesus. This is something that Jesus himself taught to the two strangers on the road to Emmaus: “And beginning with Moses and all the Prophets, he explained to them what was said in all the Scriptures concerning himself” (Luke 24:27). If we want to understand the Bible, we need to understand Jesus. And if we want to understand Jesus, we need to understand the Bible. God’s presence needs to be discovered. And the beauty of it all is that God desires to be discovered. Regardless of what our personal beliefs may be regarding the definition and extent of the inspiration of the Bible, I want to say that we cannot deny the beauty and power of the inspiration of the Holy Spirit in the entire process. Not just at the point of writing many years ago but also at the point of us reading and receiving it in this time and age. 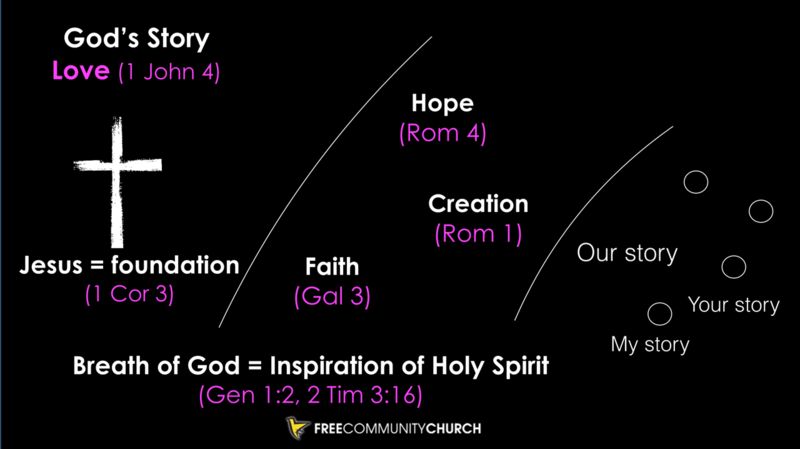 The inspiration or breath of God cuts through all the spheres from beginning to the end. The breath of God was present in the creation of the world. The inspiration of God was upon the writers of the Bible. The Holy Spirit is still present today amongst us to illumine, enlighten, empower and guide us as we interact with the biblical text. God made sure of that because God is a revealing God who desires for us to know God and be known, to love God and be loved. Jesus said the Holy Spirit is here to be our Advocate and Guide. Even as we seek God’s wisdom to navigate through the study and understanding of the Bible together, we know we are in safe hands because the breath of God is still in us today. And we worship and trust in the God who inspired the Bible — our revealing God who desires to be discovered.